"As a kid, I used you watch you with my father. The Gray Ghost was my hero...and he still is." Twelve years ago, two first-time producers had a bold vision. Bruce Timm and Eric Rodamski, native Warner Bros. Animation employees, learned that the powers-that-be were looking to develop a new animated series featuring the original Caped Crusader. Both being big fans of the famed detective, they assembled a now legendary demo piece, showcasing a groundbreaking new style that aimed to capture the true essence of Batman, utilizing the best characters and aspects of the countless comic stories and film projects, both feature and television. Visuals were extremely important. Merging 1940s art deco design with the computer technology of today, they give the blood-red-tinted Gotham city a timeless, modern feel. Among the spires prowled the Bat, drawn in a style unseen since the aforementioned decade. Character designs took on a simple, linear, somewhat angular motif, harkening back to the Max Fleischer Superman cartoons. With backgrounds painted onto black paper, an unheard of idea at the time, the show looked dark. Very dark. This was a bold, risky style that faced the threat of network censors with every frame. Timm and Rodamski set out to not only to bring an entirely new Batman to the screen, but to fill the cels with real stories and characters that had lives, desires and motivations beyond ruthless destruction or simply "doing good." They aimed to bring a complexity to the franchise that adults would enjoy, along with the action and simple lessons kids would eat up. It was certainly a fine line that some may have felt they crossed (by using a common gangster motif, with tommy guns blazing), but the level of violence was necessary, and thankfully not excessive. With Kevin Conroy's distinctive voice backing Batman, the Dark Knight had a new persona. Joined by the likes of Mark Hamill as the infamous Joker, this show had some stunning voice talent. The producers culled real actors from the ranks, not mere vocal performers. Using these amazing talents, some of the best characters were brought to stunning life throughout the first season, including Scarecrow, Clayface, Man-Bat, Two-Face, Poison Ivy, Catwoman, Mr. Freeze, Mad Hatter, Penguin and of course, Joker. Oh, let's not forget Batman's most loyal confidant/butler, Alfred. In addition to the fine visuals that only improved over time (with the New Batman/Superman Adventures being the best, ultimate refinement of the Timm style—these first designs are a bit too �fleshy�), the show was afforded an epic, theatrical feel by some extraordinary musical scores, mostly composed by Danny Elfman conductor Shirley Walker. Her gothic, brassy compositions, taking a welcome page from Elfman's moody score for Tim Burton's incarnation, brought the show to an entirely new level. The stage was set. Now, time for these visionaries' project to come to life. Armed with scripts that treated the world of Gotham as real, populated with no flat characters, all the pieces come together to create one of the most well-executed, faithful animated series ever created. This is Batman at his best, folks. The show simply shines when character, drama and action combined to create real, full stories, or �mini-movies� as the producers like to call them. One such shining example is the now legendary Heart of Ice, written by Paul Dini. This episode takes the somewhat flat character of Mr. Freeze and gives him a stunning, tragic back story regarding a lab experiment gone wrong, causing the death of his wife. His new persona is fueled not by ice, but by a thirst for revenge. Touching visuals and dialogue create one of the best Batman stories ever written. Most episodes are standalone adventures. Gangsters and cons are the antagonists of See No Evil, Vendetta and the stunning It's Never Too Late, which is a touching tale of redemption; P.O.V. is Rashomon, Batman style; Poison Ivy is introduced in Pretty Poison and the Mad Hatter in Mad as a Hatter. Two of the best episodes involve nostalgia: Beware the Gray Ghost features Bruce Wayne's childhood hero, voiced by none other than Adam West; Finally, Appointment in Crime Alley involves a touching look back at Bruce Wayne's loss. Some villains make repeat appearances. Aside from Scarecrow, who sees some character redesigns throughout his 3 episodes (Nothing to Fear, Fear of Victory, Dreams in Darkness), the Joker has the most entries in this first volume with 4 episodes. In Christmas with the Joker, Batman and Robin must save city officials from certain doom on Christmas eve; Be a Clown is weaker, as is The Last Laugh, mostly memorable for its music; Joker's Favor, a tale of blackmail, introduces the now famous sidekick Harley Quinn. There are also several epic, two-part storylines that enthrall and engage. Two-Face, Parts 1 & 2 detail the story of D.A. Harvey Dent and his schizophrenia that eventually leads to his horrific transformation into the coin-flipping Two-Face; The Cat and the Claw, Parts 1 & 2 tells the story of Selina Kyle, a.k.a. Catwoman, whose animal rights activism pits her against a terrorist organization and Batman, with whom she falls in love; Feat of Clay is the story of a disfigured actor who relies on an experimental chemical to maintain his appearance and career, before vanity pushes him over the edge, creating the tragic Clayface. This is not to say there are no flops. After the stunning pilot featuring Man-Bat, On Leather Wings, there are certainly some weak episodes. When villains' motivations were shady or non-existent, Batman saw his most dull adventures. In The Underdwellers, a group of orphans are enslaved by the Sewer King, a cross between a pirate and the Count of Monte Cristo; The Clock King is a dull villain; The Forgotten, which sees Bruce Wayne trying to break a ring that enslaves the homeless, has some nice ideas, but falls flat. Other weaker entries include I've Got Batman in My Basement and Prophecy of Doom. I used to watch this religiously when I was younger, and it's a great joy to see it again. Next to Superman, Batman has always been my favorite superhero, and he still is. There are some rough patches, but simply put, this is an extraordinary fusion of style and substance unheard of in a weekly, "kid's" animated series. The essence of Batman and his alter ego, Bruce Wayne is intact, and the duality and conflict inherent, explored. He is the ultimate crusader, strengthening both his mind and body to fight crime and evil, and to right the tragedy of his past. Dark, meaningful, but filled with hope for tomorrow, Batman: The Animated Series is a landmark chapter of the Dark Knight's long history. Image Transfer Review: Warner's 1.33:1 image has some issues, but overall, looks very good. Since this was painted on black paper, any bit of dust or blemish shows up like a spotlight. Bits of dirt do show up on a regular basis, but this is not a transfer defect. Colors are bold, dark, and detail is sharp. There is some video noise and noticeable motion "jaggies" to contend with, but this looks better than any broadcast version, though not up to snuff with Warner's more recent DC animated discs. Audio Transfer Review: The 2.0 Dolby Stereo tracks are robust and detailed, cracking with the sounds of Batarangs, Batmobiles, gunfire, and explosions, with crystal clear dialogue. The musical scores have good presence, and the track is quite dynamic, extending well into the lower frequencies. Sadly, no surround information is encoded, but these are some of the best stereo tracks I've heard. Extras Review: Volume One's twenty-eight episodes are spread across four discs. Unfortunately, each episode has only one chapter stop. They are enclosed in a colorful, fold out digipak that shows some bold artwork throughout the packaging. The front cover features a vacuum textured Batman standing tall. A bit too colorful a motif for the tone of the series, but this is still a nice looking set. Each disc contains at least one extra. Disc 1 contains the previously mentioned demo reel within a piece entitled The Dark Knight's First Night (5m:02s). It begins with comments by Bruce Timm and Eric Rodamski, shows some pencil tests and concludes with the two-minute demo. Next is a commentary on the pilot On Leather Wings with the same two accomplished producers. This is a great track that covers the inception of the series and some of the hurdles they had to jump before their vision became a reality. 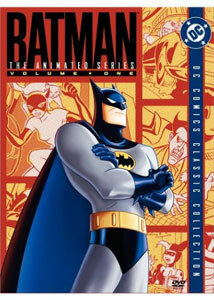 Disc 2 contains a documentary entitled Batman: The Legacy Continues (18m:00s), featuring interviews with all the important figures, including Bruce Timm, Eric Rodamski, Paul Dini, Kingdom Come writer Mark Waid, Kevin Conroy, Mark Hamill, voice director Andrea Romano, directors Dan Riba and Alan Burnett, and some DC Comics executives. This piece is a well conceived retrospective, covering the inception of the show, casting, music, the show's influence, and more. The second disc also contains the second and final commentary, this time on the episode Heart of Ice. Bruce Timm, Eric Rodamski, and writer Paul Dini discuss the directing of the show, translation from storyboard to screen, and even some minor flubs that show up (look for Batman's reverse colored Bat-symbol in a couple shots). These are great listens. Disc 3 contains a text/audio based featurette entitled Tour of the Batcave. This section contains text and narrated information on Batman, Alfred, Batman's utility belt, assorted Bat-vehicles, and include little "trailers" of sorts, featuring clips that correspond to the information presented (such as a montage of Batman using gadgets from his utility belt, etc.). Disc 4 contains three other DC animated trailers, including Challenge of the Super Friends, Justice League: Starcrossed and Batman: Mystery of the Batwoman. A nice collection of extras that kind of tailors off toward the end of the set. The commentaries are the real cream of the crop here. How about one per disc, Warner? The bold vision of Bruce Timm and Eric Rodamski brought Batman to life in a faithful, new and appropriately dark fashion. The legendary, animated incarnation of the Dark Knight shows a strong start in Warner's well-assembled box set. Thankfully replacing the trickle of single disc releases, this is a fine volume that features good a/v quality, and some thoughtful extras. Highly recommended.